After helping the war effort milking venomous snakes and working in the fire crew at MacDill Air Force Base in Tampa, Larry returned to Michigan. His animal work temporarily on hold, Tetzlaff sold vacuum cleaners and worked at Muir’s Drugstore in Kalamazoo and was later transferred to their store in Lorain, Ohio. Larry lived in Vermilion during this time and began rebuilding his animal collection. Larry had a small display at Kiddieland on the outskirts of Huron Ohio in the mid-1950s and later at Crystal Beach Park in Vermillion followed by Puritas Spring Park near Cleveland. The limited space he was often afforded prompted him to train "harmony" acts. By creating trust between each animal and himself, he was able to introduce seemingly impossible combinations of animals. In the early days, a baboon could be seen riding a hunting dog. Later, it was a vervet monkey and a lioness. It has been humorously noted that even typically truant students were often seen to show up when schools brought in Jungle Larry. 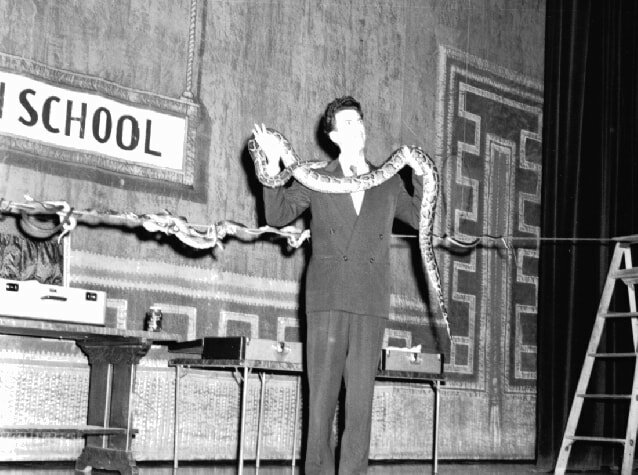 During the winters, he filled the winter months with a variety of themed educational presentations with his animals. During the week, he captured the imagination of students in assemblies. On weekends, civic groups and other organizations witnessed his films and live animals. It was also during this era, when he would meet his future wife. Larry with a Great Dane, baboon, and boa constrictor. Above and below: Larry reinforcing the positive aspects of snakes at school presentations. The passion for dispelling fears and myths about snakes would be a constant theme throughout his career.